UFO SIGHTINGS DAILY: UFO Files Released From US Forestry Service, Recent Sightings In It, Feb 2017, UFO Sighting News. 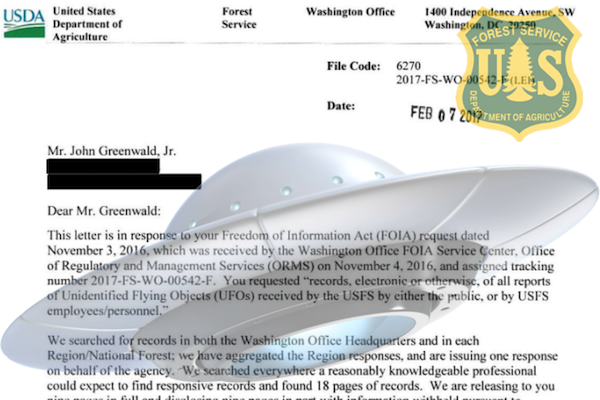 UFO Files Released From US Forestry Service, Recent Sightings In It, Feb 2017, UFO Sighting News. Christian Mace, a French UFO researcher just sent me over a message that The US Forest Service has declassified UFO files that they release. The files are more detailed that a lot of Blue Book files and many are UFO reports that took place just a few years ago with photos. This is very amazing to see recent UFO reports. For instance the first report is from February 7, 2017. We also need to thank the UFO site THE BLACK VAULT for petitioning the US Gov under the Freedom of Information Act to get these files. CLICK THE ABOVE LINK TO VIEW ALL THE FILES.